The Postpartum Period. It’s finally getting the attention it deserves! At least in writing. 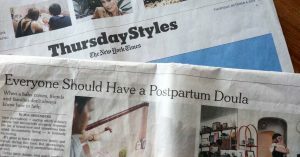 We were thrilled to see Zoe Greenberg’s article recently in the NY Times – “If Only Everyone Had a Postpartum Doula”. We couldn’t agree more. Babies have been getting all the attention and focus for years, while the needs of moms following childbirth have been overlooked in the US for far too long. After all, the birth of the baby also signifies the birth of the parents. New moms need some TLC too, sometimes taking up to a whole year (or more!) to recover from pregnancy and childbirth. In the birth world, we’ve long known that postpartum doulas and lactation consultants can be a huge help during this intense transition period. If there’s one thing we’ve learned in our many years of helping people find support in the postpartum period, it’s that there’s no replacement for human contact. In these modern times, with no shortage of virtual connections and an abundance of online information, we remain social beings. There is no replacement for human to human contact. Friends and family can offer a great deal of support if they’re nearby, but these days many new parents are far from home. Even if close-by, our immediate network is often too busy to provide the type of ongoing care new parents need, even though they mean well. That’s why we’re so grateful for the people featured in the article like our colleagues, Meema Spadola (who we’re proud to have on the boober platform) and Chanel Porchia-Albert (who passionately leads, Ancient Song Doula Services, a community-based doula organization, which supports people of color and low income families who otherwise could not afford this care). Not to mention, ALL of the amazing postpartum doulas, lactation consultants, mental health workers, pelvic floor therapists and other professional support providers that swoop in to fill the gaps left by our fractured healthcare system. Big thanks to all these amazing people!